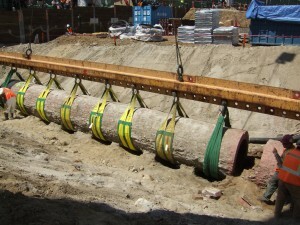 The project is located next to the Chinatown Gold Line Metro station in downtown Los Angeles. 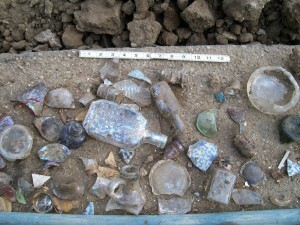 Cogstone conducted a records search, archaeological resources monitoring and artifact recovery of construction excavation on block containing portions of the Zanja Madre, historic Italian and other businesses and residences and a 19th Century hotel. Cogstone conducted a review of the 19th and 20th century Sanborn Fire Insurance maps, historic lithographs and historic aerial photos for the project block to evaluate the potential for historical archaeological resources to be present. Federal funding required coordination with HUD and FTA, compliance with Section 106 process, and consultation with SHPO regarding the Unanticipated Discovery of the Zanja Madre brick conduit. In conjunction with Metabolic Studio, a portion of the Zanja Madre was moved to become part of a future art installment called “ending the River Back Into the City”. Other portions of the Zanja was deconstructed, and the bricks will be utilized in Blossom Plaza as paving to show the alignment of the Zanja Madre with interpretive signs and information.